People keep asking to see the progress on the Volvo interior that we have shown untextured about a month ago, so we thought it is time to update you on the situation. As you can see, the interior is still not finished, but it's not so far from completion - we still need to do the dashboard and finalize a few little details. Good job,and if you can please make more functions of interior :) keep it going! This one look way better than previous interiors !!! Nice! It is possible to ask a question. When you can realize a rain on lateral glasses? Nice, but what about new europe map? It really will be twice as large? Please work at that steernig wheel, and that stupid road texture ! Great work SCS! Please next time show us the Renault Interior please! The environment of the previous game? Or Ets2? Nice interior. Very good job. Dudes, keep on working as long as necessary. We are all waiting, and hope, that ETS2 be the greatest SCS game we'd ever seen. Thanks for your work, thanks for your games. liking the the new interiors also how about incorporating a sat nav system showing us where to go instead of going into notebook to see where the red route takes us just a thought? These trees will be in ETS2? If not, thank where are new trees? The 3D artists are testing their models in a stable environment - inside the GTS+UKTS generation maps, just using the old shading effects in the old renderer. The new engine can already do much nicer things, but is still deemed unstable for 3D production use. So the environment and trees in this game are in no way representative of ETS2. Sat-nav system working like real navigation is expected to work - yes we are working on much more useful tools than the very simple things from our older games ;-). This your comment is much better to me than those pictures! Sat-nac sounds interesting. In the new engine will be dynamic shading? Awesome!! Will there be 6x4 trucks with two trailers? SCS, please make seperate buttons for low beam and high beam! Also please include retarder instead of motorbrake in this game please! Hello, the game is quite good and is getting better but we need to improve the trailers, perhaps based on real models would be great. A car park with all the trucks would be purchased legally, to improve the management system, travel by train, can travel and see our trucks purchased walking beside us, a little obstacles on the track, finally, based on the life of a truck. is it possible to make more bumps on the roads to make it more realistic. Or add speedbumps in the cities. Driving without bumps makes it a dull driving. I waiting for screens from new Magnum Interior. Greetings from Poland. Yes, please show us Magnum Interior SCS please!! is it really hard to do it? Also, working sat-nav sound amazing! So if you buy a new truck, you can choose the color on the outside and then the interior colors. 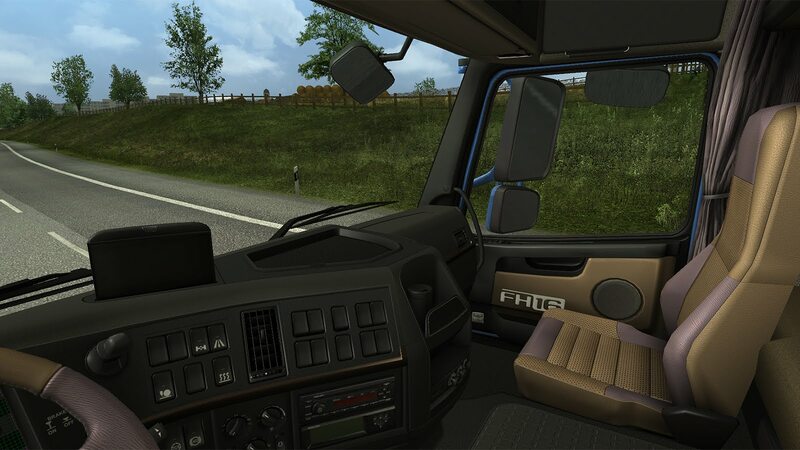 - Create an option to use mouse to interact with buttons, knobs, controls on the dashboard rather than controlling the view looking around the cab. Such as turning the key to start, lights, wipers, GPS (maybe?). Will be very helpful for TrackIR users like me :) It escalates the simulation level immensely, like in Microsoft Flight Sim X, where you have full control in the aircraft cockpit. - Rain animation for the side windows. It might be a far stretch for programming, but it would really take the realism level up a few notches. Usually the rain runs from the front to the back of the window, especially when moving quickly on the highways. - Perhaps (now this is even a bigger stretch) the ability to open windows and listen to the outside ambients (engine is clearer to hear, less muffled as well as city noises). - Windows fogging up in cold (especially rainy) weather, the need to turn the defrost on. Just a few suggestions. I really like the way this game is developing, taking the time to make it very realistic! Thank you SCS!!! 1. I am afraid we will need to do a bit of "expectations management" to avoid some of you expecting too much from us, and then feeling cheated if we don't deliver on the fantasies that we had never committed to. Euro Truck 2 will be a massive improvement over anything that we have created before, in graphics quality, in simulation precision, and in gameplay depth. But there is no chance for it to meet everyone's expectations and hopes, and to include all features that you may wish for. Please have patience with us, we are trying really hard to continuously improve our projects, but it's a difficult and long process. Our pace and ambitions are mostly dictated by your willingness to finance further development by purchases of our older games ;-). Truck simulators are really niche market products, these games can never support large teams (=high development costs), so we need to keep it lean and be careful about things. One game that fails to sell enough to recoup the development costs, and it's the end of SCS. 2. As for Magnum interior, it's really a delicate situation. We started talking to Renault, but the outcome is really open so far. Perhaps they will see it beneficial to be portrayed in our new game, but unfortunately they have also voiced some concerns, and it is even possible that we could not include any vehicle even just resembling their actual trucks at all. If they object, it wouldn't be enough just to replace the real name with a fake name, we may have to completely remove the truck model that we have already built (exterior so far) from the game. Very true SCS, can't rush a bunch of things into one game. One must take it one step at a time. Many of these suggestions I'm not really expecting to see in the next game, but rather further down the road in future releases. On the other hand, I'm glad to hear the simulation is being revamped! Just by the Volvo progress one can tell this game is going to be by far an amazing simulator. Countries and cities? Any news? Very nice work!! !Keep up SCS! !We are supporting you!! !Greetings from Greece!!! Great Progress on the interior! I'm suprised by what you've said in the comments, I was expecting basically GTS with a europe-wide map and a few features similar to those from the 18WOS series. I must say I cannot wait to see a few previews of the new map you're working on, with new prefabs and sign models. I presume the reason you showed us the volvo interior in the first place was because you had had some sucess in negotiations with Volvo? This seems a little odd as in ETS, GTS and UKTS the default volvo fh16 model was the lowest-quality and most unrealistic of them all. Can we expect to see lisenced a Actros, FH16 and Scania R-Series in ETS2 rather then a liscensed Renault Magnum, Iveco Stralis, DAF XF or whatever else you choose to include? Also, when you say it will be better quality and the gamplay will be enhanced do you mean that the changes will be larger then they were with GTS and UKTS, or will they be fairly similar? Whether there will be a support of rudder G25, G27? Hi SCS, first of all great job with the volvo interior! I am not too concerned about not getting licensed truck brands, as long as modded trucks can be added to the game. (a) A flexible modding system similar to Extreme Trucker, so that we can have standalone trucks and trailers, double trailers and rigid truck cargo. (b) Better AI traffic. AI vehicles turning left at 2-lane road junctions for example. (c) If possible make it easier to mod interiors so that animations arent lost while doing so. (d) Improved physics (but I believe that's done). Do you work in a multiplayer for ETS2? I have some ideas - you may add some random events, such as an trafic accidents, trafic jam in cities. I also think you may add some "minigames". I dont know what exactly it would be or how it could work, but it will dramaticly improve gameplay. Could be for example something like changing of destroyed wheel, changing destroyed bulbs, ... Even it will be scripted simply, it will take us from stereotype, when you are always driving. And if its scripted harder, nothing could be better! I would also like to see 6x2/6x4(/8x4) trucks ingame. And trucks with liftable third axle will look great! - action acessable by mouse while in interior - hit some key to deactivate mouse look and to show cursor, then you can acess buttons on board. thats all :) Thank you for tireless developing! Can you show us some new traffic models please, and some new prefabs maybe? If you buy a truck in the uk, it has RHD and if bought in the continent, LHD. Or the option to switch between the two. When will be new map pictures? Looks fantastic. But PLEASE remember to make visor in all interiors. great interior just the floor is a bit too high but all good ! !